Ready for your high performance computing needs, a WD Blue™ 3D NAND SATA SSD offers high capacity, enhanced reliability, and blazing speed. 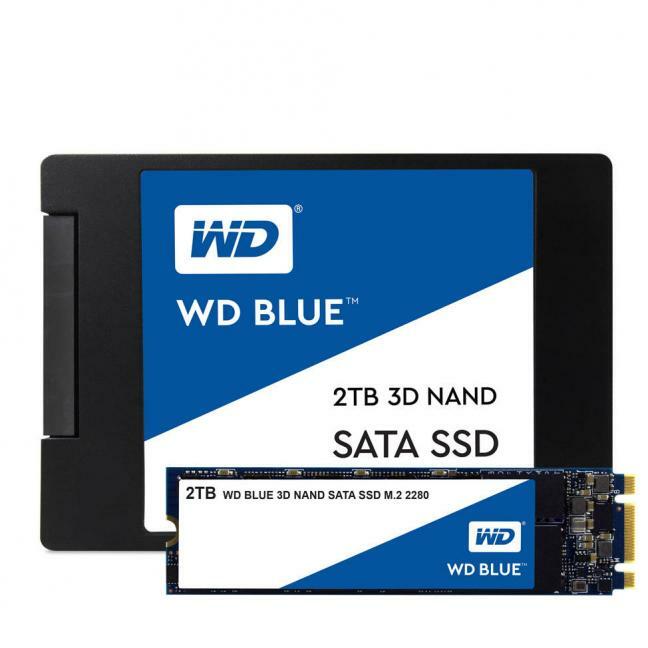 A WD Blue 3D NAND SATA SSD uses 3D NAND technology not only for higher capacities (up to 2TB1) than the previous generation WD Blue SSDs, but also to help reduce cell-to-cell interference for enhanced reliability. Offering improved endurance, a WD Blue 3D NAND SATA SSD features an active power draw up to 25% lower2 than previous generations of WD Blue SSDs. And with less power used, you’re able to work longer before recharging your laptop. For high-end computing applications like gaming, HD media playback, or creative software, look to WD Blue 3D NAND SATA SSDs. 3D NAND technology helps enable sequential read speeds up to 560MB/s and sequential write speeds up to 530MB/s for fast system boot-ups, quick application responses, and rapid transfer speeds3. An SSD is designed with no moving parts to help protect against data loss if it is accidentally bumped or dropped. And with 1.75M hours MTTF (mean time to failure)4, up to 500 TBW (terabytes written)5, and several error correction technologies, WD Blue 3D NAND SATA SSDs can help guard data for years to come. With a certification from the WD Functional Integrity Testing Lab (F.I.T. Lab™), every WD Blue 3D NAND SATA SSD is verified for compatibility with a wide range of desktop and laptop computers. 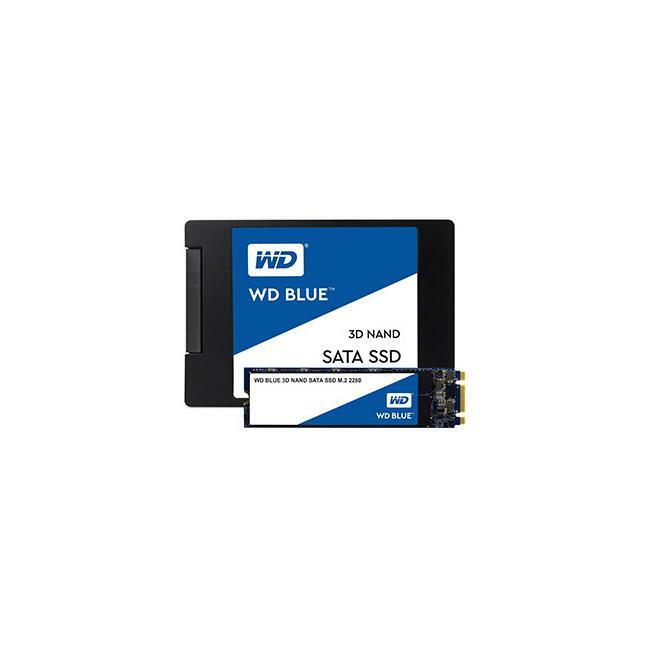 Every WD Blue 3D NAND SATA SSD goes through extensive compatibility and reliability testing to ensure it meets the high standards of the WD brand. Monitor your drive’s available capacity, operating temperatures, SMART attributes and more with the WD SSD Dashboard. Acronis® True Image™ WD Edition software, available as a free download, can clone drives and backup your operating system, applications, settings and all of your data. 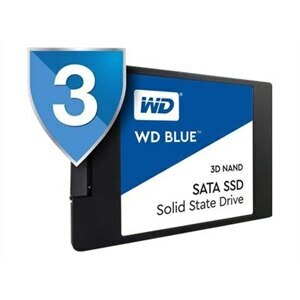 Every WD Blue 3D NAND SATA SSD comes with a 5-year limited warranty, so you can be confident of your storage when you upgrade or replace any of your drives. 1. As used for storage capacity, one terabyte (TB) = one trillion bytes. Total accessible capacity varies depending on operating environment. 2. Active power draws are up to 25% lower during sequential reads than previous generations of WD Blue™ SSD at the 500GB capacity point. 3. For 500GB and 1TB capacity. As used for transfer rate, megabyte per second (MB/s) = one million bytes per second. Performance will vary depending on your hardware and software components and configurations. 4. MTTF = Mean Time To Failure based on internal testing using Telcordia stress part testing. 5. TBW (terabytes written) values calculated using JEDEC client workload (JESD219) and vary by product capacity. Ready for your high performance computing needs, WD Blue 3D NAND SATA SSD offers high capacity, enhanced reliability, and blazing speed. DEVSLP SATA low power mode, 3D NAND Technology, S.M.A.R.T.